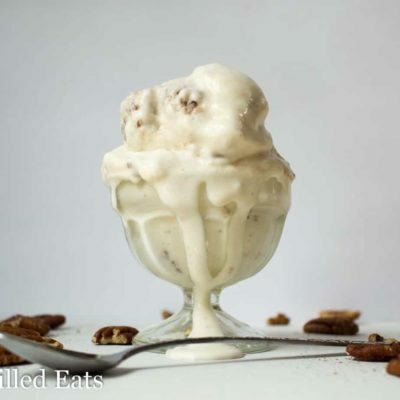 This Pecan Praline Low Carb Ice Cream might be my favorite ice cream ever. 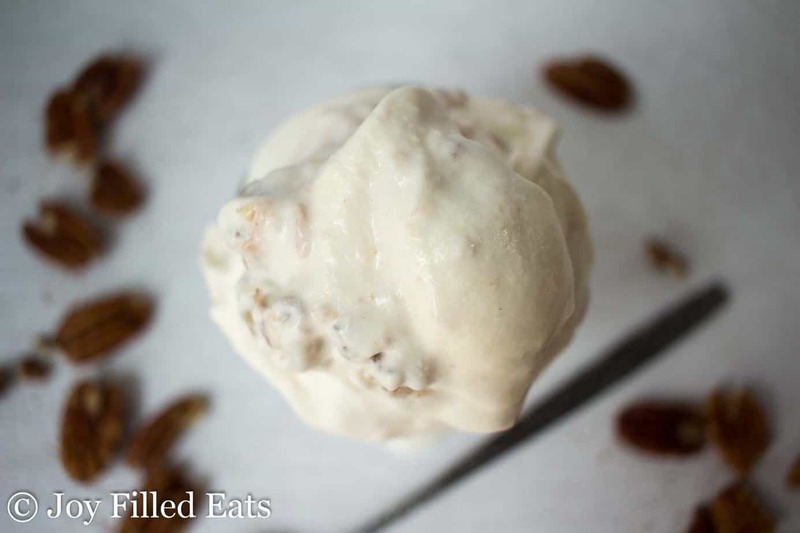 There is something about a simple sweet cream ice cream with pieces of praline throughout that is irresistible. 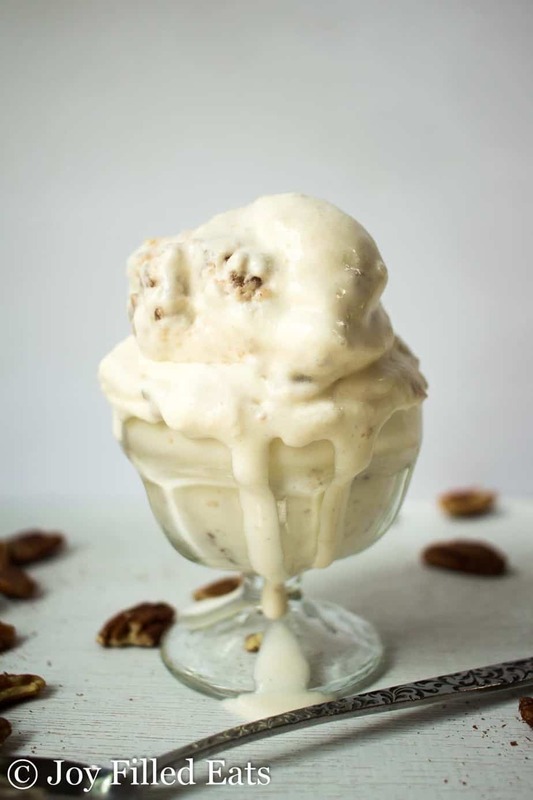 Admitting this is my favorite ice cream is saying a lot since I just posted my Mini Snickers Ice Cream Bites and I can’t forget my old ice cream favorites Cannoli and Cinnamon Roll. 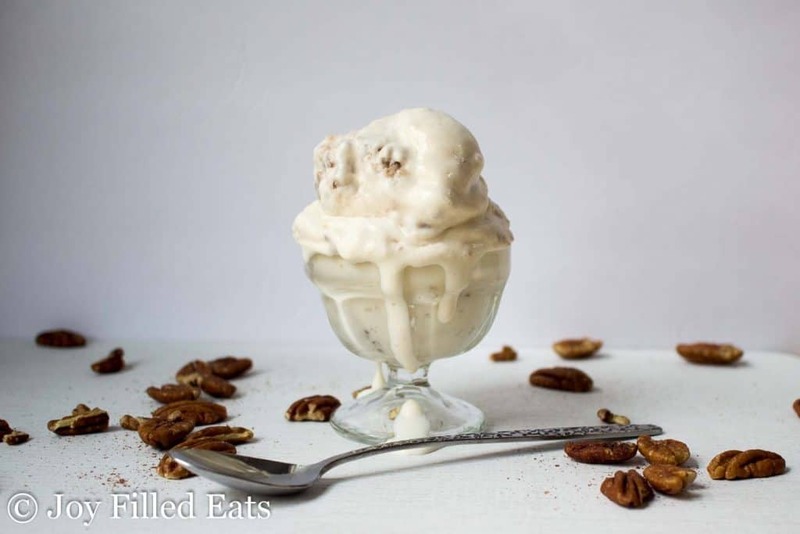 But I’m certain that when you try my Pecan Praline Low Carb Ice Cream you will not be disappointed. It’s been a bit on the warm side in NJ this week. I think today hit 100. Even with the air conditioner in my kitchen on high my ice cream was still dripping down the sides of the bowl. I thought about redoing the pictures but at 32 weeks pregnant, I’m happy enough with these. There is something appetizing about a big bowl of drippy ice cream. It makes you want to lick the screen to save that drip, right? I love my ice cream maker. I have had this one for over 10 years after a brief stint with one that required ice cubes and salt. Having an extra freezer bowl means I always have one in the freezer. When I take one out to make ice cream I put the second one right where it was. 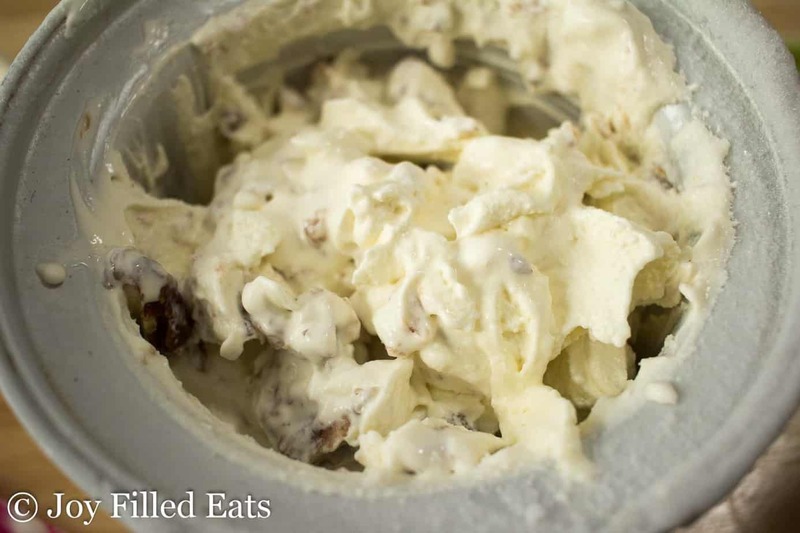 Freshly churned ice cream with real ingredients is one of life’s truest pleasures. 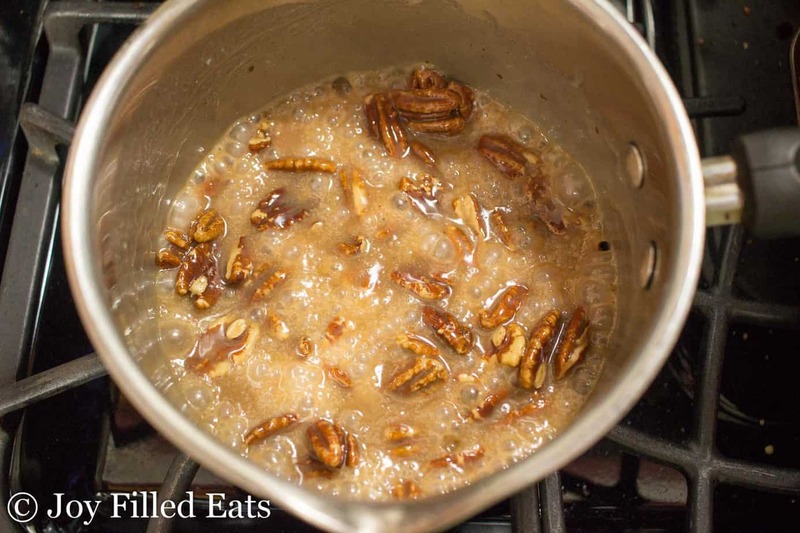 In this saucepan is my Creamy Pecan Praline recipe. The only change is instead of making circles I just poured it all on a parchment lined tray. Since I was going to chop it up anyway I eliminated a step that way. It is easier than you think. Boil cream, butter, and sweetener. 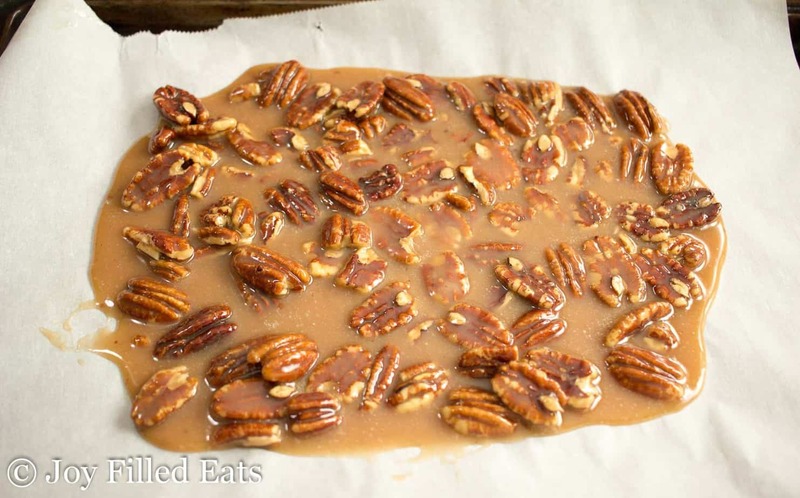 Add vanilla, salt, and toasted pecans. That’s it. Mmmm. I enjoy licking the spoon when I make this. Just be careful not to burn your tongue. I know from experience. Cooled, chopped, and ready to be swirled into the sweet cream ice cream. Add ice cream ingredients to a blender and blend until smooth. Churn in an ice cream machine according to the manufacturer’s instructions. Gently fold in the chopped pralines. Freeze until firm. Add ice cream ingredients to a blender and blend until smooth. Churn in an ice cream machine according to the manufacturer's instructions. 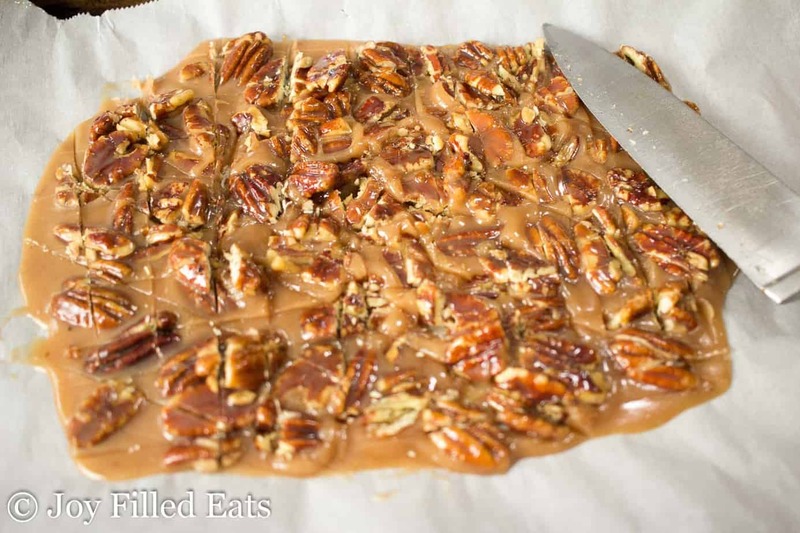 Gently fold in the chopped pralines. Freeze until firm. My country doesn't have vegetable glycerin. Could I use a similar amount of vodka instead? By tempering do you mean cooking to make a custard? 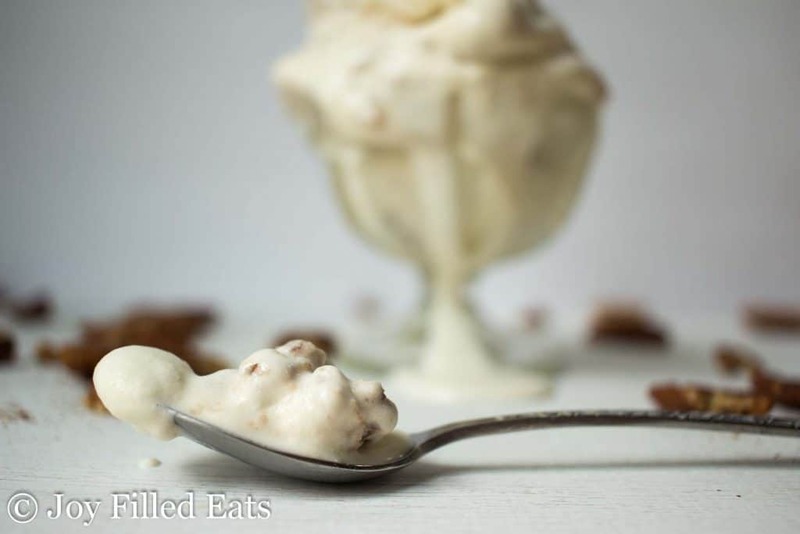 This has a higher fat content than store bought ice cream but it should be creamy. How would you describe the texture you ended up with? It won;t let me pin these...says pictures need to be larger....fyi thank you! If you click the pin icon on the top or side of the page a special pin with text pops up. WhT is the purpose of the vegetable glycerin? It helps the ice cream not freeze solid. 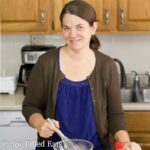 You can omit it if you don't mind letting the ice cream sit out at room temperature for about thirty minutes before scooping.